TULSA, OK (KJRH) — That's All --- Brother lead the American fleet over Normandy on D-Day, June 6, 1944. 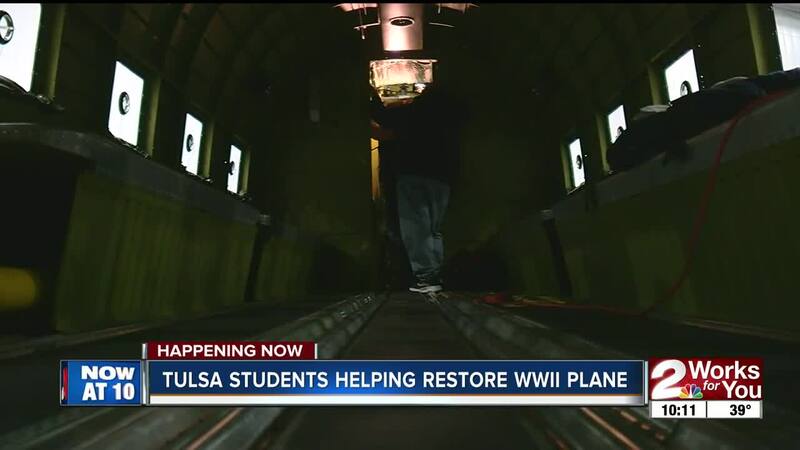 75 years later, Tulsa students and seasoned engineers are joining forces to get the war bird back in the air over Europe in time for this year’s D-Day ceremony. The plane was built in Tulsa, and sent overseas to carry paratroopers into Germany-occupied France. After D-Day, That's All --- Brother continued to push inland, and remained in Germany years after World War II ended. But after 75 years, it's only ever flown over Normandy once. In June, 75 years, that is going to change. "The airplane was discovered about five years ago in a junkyard," said Engineering Officer David Snell. "That's All --- Brother is a name, as far as I can tell, that meant we were taking Europe back. And so they were telling the Germans, 'That's all, brother. You're done.'" Two years ago, Snell found out the plane was coming back home to Tulsa for internal repairs. He began building a team of all ages to get the job done. On Valentine's Day 2019, That's All --- Brother will leave Tulsa for the last time until fall. It will go around the country to air shows, raising funds for the trip to France. That trip will consist of several refueling stops, including New York, Canada, Greenland, Iceland, and Scotland. Thanks to hard work by the team in the airplane's home city, That's All --- Brother will make its second-ever trip over Normandy beach on June 6, 2019 - 75 years to the day after its first.